"These baguette toasts are ready for a party topped with black and green olives over smooth spreadable cheeses in this easy gourmet appetizer." Set oven rack about 6 inches from the heat source and preheat the oven's broiler. Place baguette slices on a baking sheet. Mix cream cheese and semi-soft cheese together in a bowl. Combine black olives, green olives, red peppers, parsley, and garlic in a bowl to make the olive salad. Broil baguette slices until golden brown, 3 to 5 minutes. Spread cheese mixture over baguette slices and top with the olive salad. 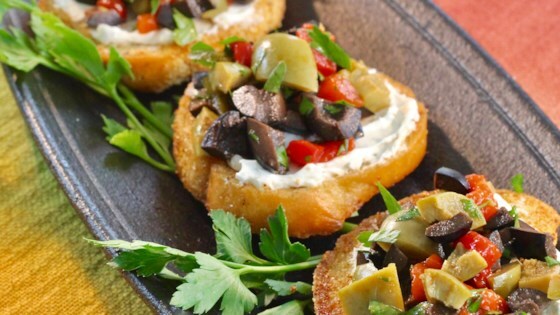 This easy appetizer captures the freshest flavors of summer. 11.10.17 Tasty, quick and easy appy with good eye appeal. Instead of the expensive Boursin herb cheese, I used Herbed Cheese Spread on the AR site and skipped the garlic in the recipe.